Place the butter in a wide stainless steel skillet over medium heat. Let the butter melt, then let it cook, swirling the pan occasionally, until the butter is quite brown and smells toasted. Remove from the heat and let cool. Mix the milk and cream in a heavy saucepan. Measure out 2-3 tablespoons of the milk and pour it into a separate bowl, then whisk in the cornstarch. Set aside. Whisk the sugar and corn syrup into the milk mixture in the saucepan, and bring to a simmer over medium heat. Whisk until the sugar is completely dissolved, being careful not to let the milk boil over. Simmer lightly for about 5 minutes, then pour in the milk and cornstarch mixture and whisk to combine. Return to the heat and cook, stirring, for about one minute. Remove from the heat. Combine the cooked milk mixture with the cooled brown butter in a blender or food processor. Carefully blend at high speed (hold the lid on with a towel!) until completely mixed and emulsified. Add in the vanilla and blend for another 30 seconds. Cool the milk and butter mixture in the fridge for at least two hours, or overnight. Freeze in your KitchenAid stand mixer ice cream maker accessory according to instructions. Add the salt into the ice cream maker in the last few minutes of churning. 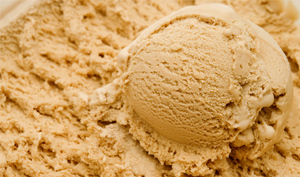 Pack into a freezer container and cover the top of the ice cream with plastic wrap or wax paper. Freeze for at least two hours before serving.